Green energy upgrade projects in multifamily properties benefit from careful, holistic planning and quality implementation. Your project’s success hinges on working with high quality professionals including consultants, contractors, and utility vendors throughout the process. This page provides resources to guide your search for energy analysis, design, and installation professionals for multifamily projects in Connecticut. These resources are designed to support all levels of project complexity – from simple, single measure energy improvements to more complex deep energy retrofits. They can be used for making improvements to an existing property or building new. Please note the Connecticut Green Bank does not make recommendations for individual contractors. For further assistance, please contact us. Specific energy improvements to existing buildings can often be completed satisfactorily by a qualified vendor or contractor who evaluates, designs, and implements energy improvements. For more comprehensive approaches with higher impact outcomes, energy design and commissioning professionals can assist with a wide variety of pre-development and implementation tasks necessary to achieve your goals. As with any major purchase, you should exercise diligence when hiring a design or implementation professional. Consider interviewing multiple professionals. Request and compare price quotes. Relevant experience and expertise (review prior projects and/or references). For smaller projects, a simple interview process with local contractors may be sufficient to provide you with confidence in their ability to meet your expectations. For medium or large projects, owners typically execute a formal bid and selection process. The Green Bank has developed sample requests for qualifications (RFQs) for commonly used services to assist in selecting the right contractor. Download the document, modify the highlighted information to suit your project, and you’re good to go! Several organizations maintain lists of certified, pre-qualified, or approved contractors. The Connecticut Green Bank is providing the list below of contractors as a resource and convenience as you consider a contractor for a multifamily energy improvement. We do not in any way endorse particular contractors and strongly encourage you to perform your own due diligence before hiring. The Green Bank maintains an alphabetic list of professionals with experience implementing Green Bank-funded solar projects. Performance is not guaranteed, but familiarity with our financing products can be a plus. Connecticut Green Bank Past Project Service Providers (Pre-design, design, and technical assistance consultants; implementation contractors) – Registered professionals, contractors and others operating in Connecticut that have provided various energy-related services on previous Connecticut Green Bank multifamily projects. Capital For Change Participating Contractors (Implementation contractors) – These contractors are authorized to perform work that is funded by Capital For Change, formerly the Connecticut Housing Investment Fund, Inc. (CHIF). Please note, this list contains contractors for multifamily and single family projects. 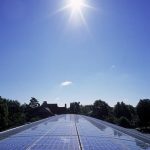 Energize Connecticut Home Energy Solutions Providers (Implementation contractors) – Utility vendors on this list are registered contractors operating in Connecticut that will perform basic energy efficiency services. Most of these firms are implementation contractors, not design firms. Please note, this list contains contractors for multifamily and single family projects. Many other state, regional, and national organizations provide lists of consultants, contractors and/or vendors working in this space. Please see below for selected resources. Connecticut Chapter of the Association of Energy Engineers (AEE) (Various AEE Certified Energy and Buildings Experts) – Experts in various fields are certified by this industry association. Enter “Connecticut” as the state in the search form; searches can also be limited to a specific certification type. Connecticut Passive House (Certified Passive House Design Professionals) – This membership directory indicates which members are certified as passive house experts. Connecticut Green Building Council (CTGBC) (Green Building Council Members) – Contact the CTGBC to connect with members with your desired expertise. Northeast Sustainable Energy Association (NESEA) (NESEA Members) – This membership directory is searchable; enter “Connecticut” as the state in the search form at the link shown above; searches can also be limited to a specific type of expertise. American Institute of Architects CT (AIACT) (Registered architects in Connecticut) – This statewide membership directory may be filtered by location and project type. For a nationwide list of registered firms, click here. Building Commissioning Certification Board (Building Commissioning Professionals Certified by the BCxA) – This registry is an online list of commissioning professionals certified by the Building Commissioning Association which also has a Northeast chapter. Enterprise Community Partners Technical Assistance Provider Database (Pre-design, design, and technical assistance consultants) – A national list of firms providing technical assistance to multifamily projects in a variety of fields: energy modeling, green operations and maintenance, and resilience are examples. Con-Edison Contractor List (Implementation contractors) – A list of contractors & contact information – consultants, electricians, plumbers, and energy management system installers. Some listed firms also work in Connecticut. The Connecticut Green Bank and Connecticut Housing Coalition host monthly Peer to Peer Network meetings for those working in the multifamily energy space. Presentations from those meetings can be found here. To learn more about this network, please contact us. Gina was looking to replace oil-fired boilers in her 60-unit 1970s mid-rise. Since the gas utility company had recently extended their natural gas line into the neighborhood, she decided to hire an engineer to help make sense of her boiler options, and to identify and evaluate both energy opportunities and any health and safety needs. 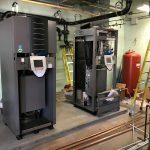 The engineer found that, in addition to switching to gas-fired boilers, it made sense to upgrade the doors and windows in all common areas, to add a solar photovoltaic (PV) system, and that radon mitigation was also indicated. By rolling all of this work into one project, the energy improvements helped finance the radon mitigation system installation, and the property still expects to save 10% annually on energy costs. To hire her engineer, Gina asked her colleagues for references. She got some suggestions, but none of them seemed right. She decided to issue a Request for Qualifications (RFQ) to find a company that had worked on projects like hers before. See the links at left for sample RFQs you may be able to modify to meet your needs. Since Gina was planning to use Connecticut Green Bank financing on her project, she wanted to use contractors familiar with the Green Bank's rules and requirements. Two contractors on the Green Bank's list were doing work in her town, so she invited them both for interviews. See the links at left for various lists that can help you connect with contractors and other resources. Ray is the owner of an 80-unit 10-story building. The roof was failing and his tenants were complaining about high electric bills stemming from the older, inefficient heating and cooling equipment. He needed financing help and an engineer to design a new HVAC system — but where to find the money and the expertise? Ray worked with the Connecticut Green Bank and obtained development phase financing to cover the costs of hiring experienced design professionals early on.